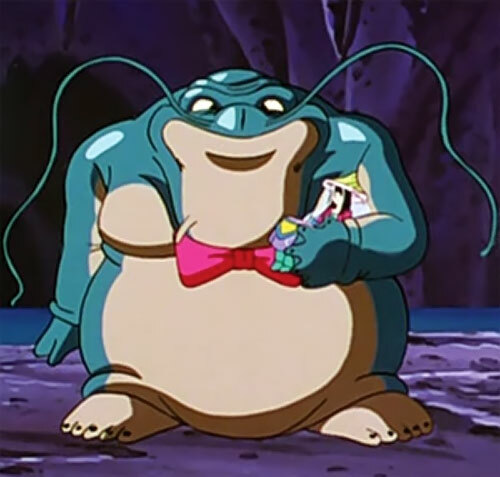 Zoonama (or Tsunama, or others… the spelling seems to be different everywhere I look online) is a Dragonball monster. 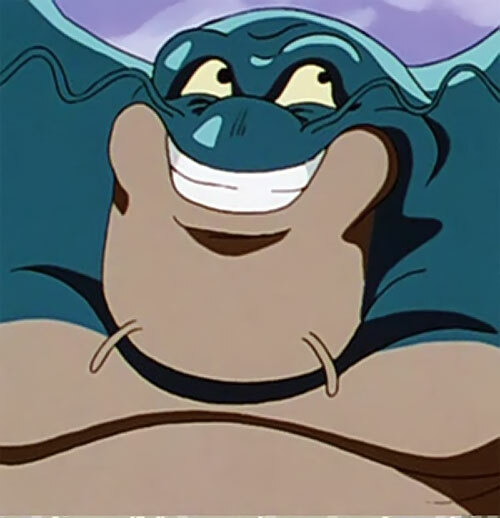 He appears early on, in the seventh episode of the animé (1996). Base Of Operations: A cave near the peaceful village. Height: 13’0” Weight: 850 lbs. Zoonama is an intelligent giant aquatic creature. He is strong and durable. But the ability that has given him the most advantage has been his ability to discern when earthquakes are about to happen. By pretending to be the cause of the earthquake he held a reign of terror over a small village for a long time. On a blue-green planet called Gelbo (sp ? ), in a peaceful village, the chieftain’s daughter Lane got ready to be a bride. Her marriage however, was not a happy occasion for her. She was being forced to marry a creature who threatened to destroy the entire village with the eruption of a volcano or a destructive earthquake. This creature is Zoonama . Goku, Pan, and Trunks arrived in search of the Dragonballs and this particular princess was using the ball as part of her wedding attire. Zoonama had been a scourge to the village for some time. He was considered an evil god who can cause earthquakes by shaking his whiskers. The villagers tried to appease him by offering him their most valuable possessions. Their finest corn, the best of their grapes, precious nuts and golden grain but nothing satisfies him anymore. Zoonama was no longer interested in treasure and instead wanted the villages women. That is why the princess has decided she would be the one to marry with the beast. After describing their predicament and seeing the gigantic creature in action, Pan came up with a plan. Trunks would dress as the ultimate bride-to-be and take Lane’s place in the wedding. Infiltrate Zoonama’s lair and Trunks would use a pair of giant scissors to cut off Zoonama’s quake-producing whiskers, removing his power and making the village safe. The next morning, Doma, the princess’ true love, decided to fight beside Trunks and the others against Zoonama. He carried the giant scissors on his back. A woman from the village gave Pan a jug of wine to put Zoonama asleep to make the whisker cutting go easier. Zoonama was fooled by Trunk’s acting and took him back to his lair. He dived into a pool and swam through a tunnel until they arrived at a series of caverns that rested directly over a magma pool. Zoonama had clearly been planning for this day for some time. He had an array of human sized women’s clothing and many other treasures gathered from the village. Trunks lost his wig and Zoonama discovered he was not Lane. However, he was able to recover when Zoonama declared Trunks was an atheletic short haired woman. Later, Trunks was able to get Zoonama to drink the wine. All seemed to be going as planned. Zoonama briefly went ballistic and started attacking everyone but then passed out. Doma cut off one whisker but a sneeze caused Zoonama to awaken. When he found one of his whisker had been cut he began shaking his single whisker and the ground began to shake! However, when the earthquake passed, Zoonama was still shaking his whisker. In his drunken condition he hadn’t realized the quake had passed. It was then that Pan realized that Zoonama didn’t have the power to create earthquakes only to predict them. However, Zoonama’s whisker began shaking uncontrollably again and the Volcano began to erupt. The group, along with Zoonama, fled as quickly as they could. Goku used his Kamehameha wave to give them all a boost out of the underground tunnels and onto dry land again. Goku used another Kamehameha wave and destroyed the entire volcano. This sealed off the flow of lava and saving the village. Zoonama became very gentle and joined the villagers. Just don’t give him anything to drink. 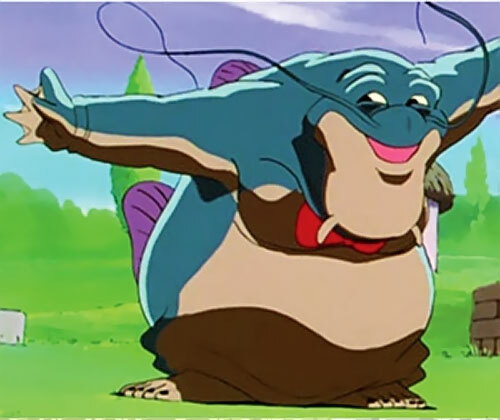 Zoonama appears as a giant blue-skinned anthropomorphic Koi fish. His back and tail have purple fins on them. His under-belly is tan in color and goes all the way to the ground between his two stubby legs. His hands have webbing grown between the fingers. 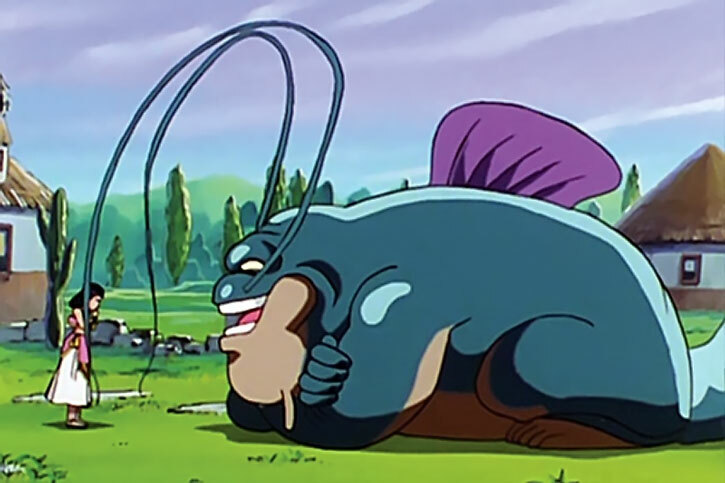 His barbels “Whiskers” are twice as long as his arms. Zoonama is only happy when he gets what he wants. When he doesn’t get what he wants he will thow a tantrum like a child, throwing himself on the floor and flailing about. He is quick to threaten an earthquake or volcano eruption to get others to do what he wants. According to the terrorized villagers, Zoonama strikes fear in the hearts of those weaker than himself. There is no light in his heart, only darkness. 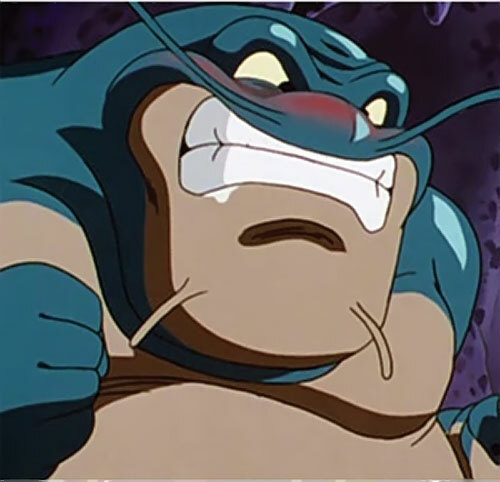 When confronted with powerful foes like Goku, Zoonama begged for forgiveness and cried like a baby. When Zoonama walks, the sound of his approach can be heard in each thunderous step. He drags his tail in the dirt behind him. At the end however, the villagers get to know him and he becomes their gentle giant. 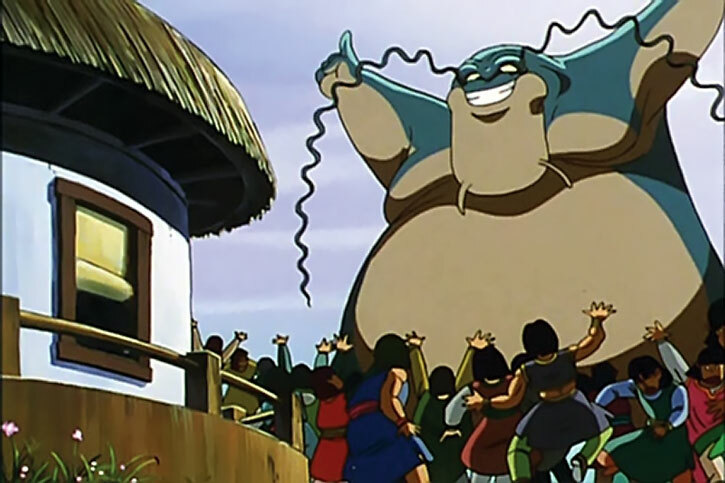 Later, during the Shadow Dragon Saga, Zoonama can be seeng contributing energy to Goku’s Spirit Bomb alongside the villagers. Extra Limb power (Tail) may not be used for grappling (-1). Superbreath is uncontrollable and and is only used when Zoonama sneezes (-2). Detect has the Bonus Discerning and Zoonama’s whiskers will shake uncontrollably (+1 FC). None. Later, Peaceful Village (High) by the end of the episode “Whisker power”. I wanted to do this writeup because of the way this character used a simple power to great effect. I was totally surprised by what was actually going on. 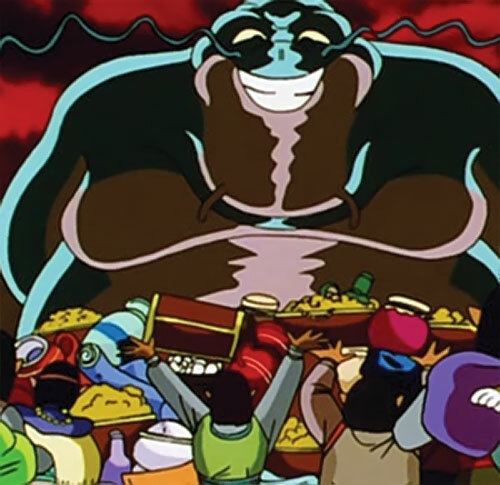 Zoonama’s wealth is made up of the treasures he took from the village. At the end of Whisker Power his Wealth is 000 because the volcano destroyed all of his possessions. It’s hard to say just how much the treasures he had collected were actually worth. I arrived at 08 APs of Detect because at 16 minutes Zoonama would have enough time to detect an earthquake coming and still get to the village to put on his show. I gave him Discerning because he knew the last quake was much larger than other quakes he had sensed. Source of Character: The Funimation animated T.V. 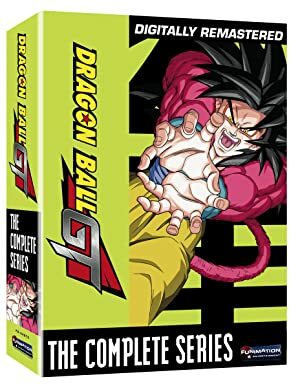 Series Dragonball GT Season One, episodes Trunks the Bride and Whisker Power. Writeup completed on the 4th of April, 2011.